Sharing my food experiences at local restaurants is normally the inspiration behind my posts. This time I am honored to have the chance to write about something different, a recipe with a purpose. Soul Food Sessions mission is to increase opportunities in the food industry for minority chefs to set the scene for a better future. SFS started as a series of non-profit "pop-up dinner series" here in Charlotte. Now they're on the move to three new cities. Through a valuable partnership with Coca-Cola Consolidated they are paving the way to keep conversations going about equal opportunities in the culinary field. "The table is set for lasting change in the culinary industry." Lucky for us, Charlotte is Coca-Cola Consolidated's home market so that means we get to be the first stop in the four-city tour. The event will be on Tuesday June 19th at Free Range Brewing in NoDa. Then they're off to Washington D.C., Baltimore and Charleston. There are a series of appetizers and main courses that will be introduced throughout this tour. Here is the appetizer I recreated at home that will be presented during the kick-off event at Free Range. It was really fun to make and tasted delicious. The simple fact that my house smelled like balsamic vinegar for a couple hours was a big plus. The person behind this creative appetizer is Chef Greg Williams, you may know him as the chef and owner of What the Fries CLT food truck. Why a Coke Zero? 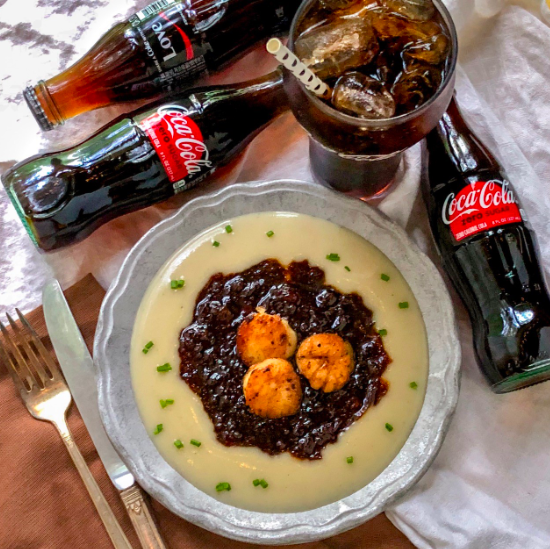 "Coca-Cola Zero Sugar brings to the forefront the richness of scallops combined with the boastful flavors of ginger and garlic in chutney." 1. Heat 1 tablespoon olive oil in medium sauté pan over medium heat. Add carrots, onion, garlic, ginger and sugar. Let brown and caramelize for 5 minutes. Add balsamic vinegar to deglaze pan. Cook for 30 minutes. Set aside. 2. Heat 1 tablespoon olive oil in medium sauté pan over medium heat. Dry scallops with paper towel and salt and pepper to taste. Add to pan, being careful not to overcrowd scallops. Sear until golden-brown; flip and repeat. 3. Spoon potato leek soup into base of bowl. Top with chutney and scallops. Finish with chives and balsamic vinaigrette. 4. 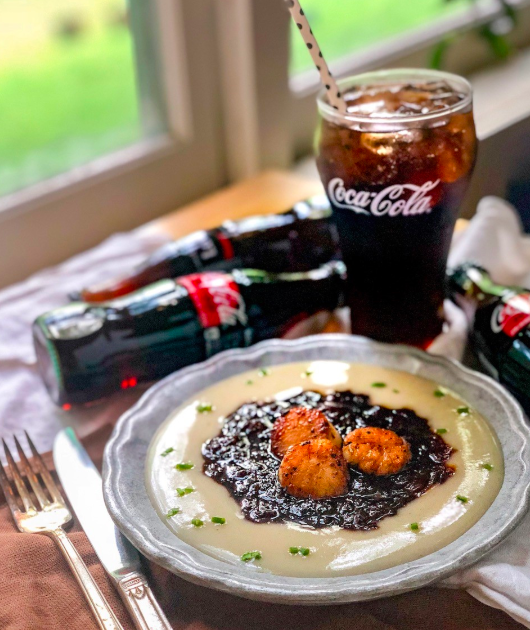 Serve and enjoy with a Coca-Cola Zero Sugar. Get your tickets here and show your support. Your seat is waiting. This post was sponsored by Coca-Cola Consolidated. Thank you so much for the opportunity to help promote a good cause.